Ace Motorworks is a full service motorcycle shop in Houston. We work on most bikes, from American and Metric to European, classic to current. No project is too big or too small, and here we have a can-do attitude. We do standard service, repair, full engine builds, insurance quotes, and customs with full parts availability. From changing tires and oil to fabricating a custom rear end for your chopper, we are a one stop shop that can make it all happen. Our service is fast, friendly, honest, affordable, and guaranteed. 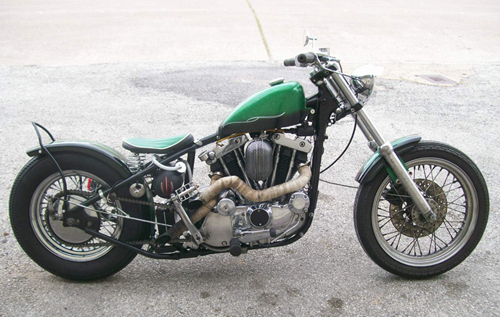 Whether its restoring your 60's Triumph or installing a set of cams in your new Sportster, Ace Motorworks does it all. Fabrication, Custom Paint, Powder Coating and Wheel Building are just some of the services we can provide. Are you tired of other shops telling you they won’t work on your bike because its more than 10 years old? Well here at Ace Motorworks we are true enthusiasts of motorcycling and we are happy to service all your bikes from the 70's and up. And we have the knowledge and skill to back it up. So come on by or call and see what we can do for you. Open Tuesday to Friday, 10am to 6pm. Saturdays from Noon to 5pm. We are conveniently and centrally located in Houston close to 610 and I-45 South. We can recommend towing companies for transporting your vehicle.